Wanted poster for D.B. Cooper/Wikimedia Commons. The parachuting hijacker who may have escaped with $200,000 ransom in 1971 isn’t really D.B. Cooper, according to a team who obtained the his letters to newspapers through the Freedom of Information Act. According to the team, hidden code in the messages reveals that Cooper is actually Vietnam War veteran Robert Rackstraw, who briefly served in the same army security unit as one of the team members, former Army codebreaker Rick Sherwood. Rackstraw is now living in the San Diego area. Courthouse News Service, Seattle PI and the Indianapolis Star have stories. Sherwood says he learned the code during his Army training, and Rackstraw would also have learned it. The code assigns numeric values to the alphabet (with A equaling 1, B equaling 2, and so on). Sherwood created numeric values for words, phrases and numbers that were repeated or didn’t fit, he told the Star. For example, “Wash Post” in the fifth letter was the only newspaper that wasn’t fully spelled out. It has a numeric value of 121, which is also the value for “top secret.” Sherwood believes “top secret” refers to Rackstraw’s work on a top secret project. 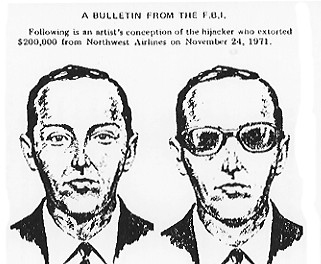 The FBI had dismissed Rackstraw as a suspect in the 1970s. Rackstraw told Seattle PI last year that a reporter should verify the team’s earlier claims that he was Cooper.